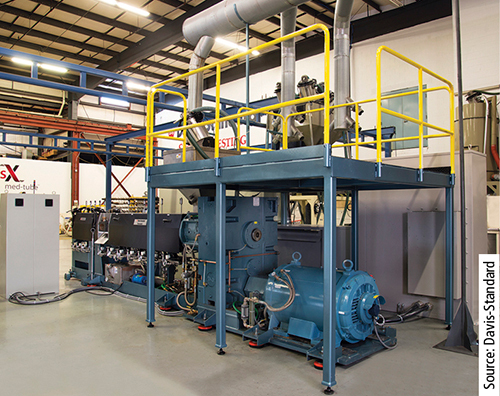 Davis-Standard’s Thermatic Series extruder is available for trials at its site in Pawcatuck. Davis-Standard announced that a Thermatic Series 4.5 inch (114 mm) extruder has been installed for trials at its Extrusion Technology Development Center in Pawcatuck, CT, USA. The extruder is being used for internal R+D and product development for customers. Its features include 400 HP water-cooled motor technology, a screw speed range up to 375 min-1, advanced and conventional vent diverter geometry, an improved barrel cooling system and next generation gearbox technology. The extruder is equipped with an Epic III control system that features a streamlined console, high-data transmission rate and improved graphics. It is also engineered with smart extruder technology for preventative maintenance monitoring of vibration, oil composition, motor parameters, heater status, screw wear algorithm, and energy consumption. Other features include a high wear-resistant barrel and feedscrew, an integrated melt pump with controls, static mixer, and an optimised mezzanine design. The extruder can be fit with the complete line of DSB feedscrews including the DSB I, DSB II, DSB III and DSB III-Plus designs as well as the TS DSBM, TS Metering and TS DS-Blend, in addition to a variety of metering screws and other specialised designs.